A spiral type ending to a stair handrail. In most cases they transform from the sloping section to the horizontal plane. 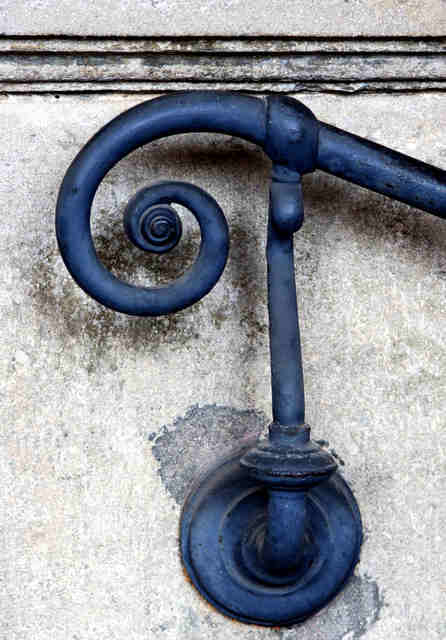 Also called a Handrail Volute in the US. 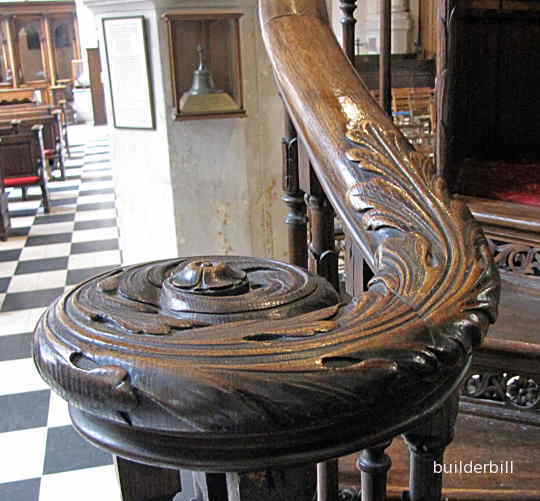 This beatifull old carved scroll is in the St. Sepulchre-without-Newgate parish church in central London. The church was founded in 1137 and this piece of English joinery predates the sailing of the Mayflower to the new world by many years. An item of note here is the hand-bell in the glass case in the background. It is the original Newgate Exection Bell that was rung at midnight to awaken the condemned prior to an execution. Used in literature from Shakespeare to Hemmingway. John Donne, 1572 to 1631, would have heard this bell many times before he wrote the lines of his Meditation XVII.
" Any man's death diminishes me, because I am involved in mankind and therefore never send to know for whom the bell tolls it tolls for thee". The function of a scroll is purely decorative and many modern staircase do not use them or only give a slight nod to their existance. The term is derived from it's similarity to the common representation of a scroll (partly unrolled parchment) or to the scrolls on top of Greek columns. The form is a decreasing spiral. The geometry is fairly simple as it is a series of 90deg. circular arcs of diminishing size. The term mainly used in the US is Volute which is a fair enough description of the item. What I do disagree with is the modern trend of dumbing down perfectly good and descriptive technical terms. There is one US stair manufacturer (who shall be nameless) who actually calls these scrolls "Frying Pans". The mind boggles. 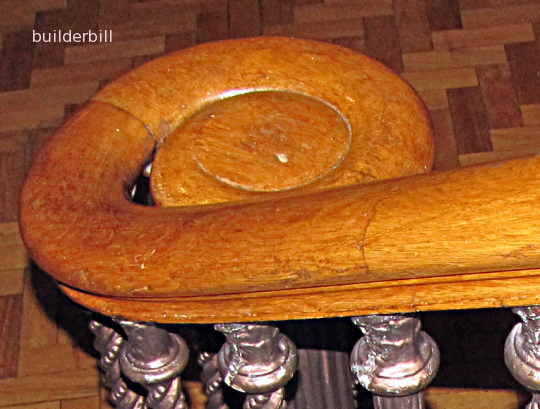 Another quite nice handrail volute. A form loved by blacksmiths through the ages. The decreasing spiral. Thanks to Clarita and Morguefile for the photo. On odd occaisions we see a vertically orientated scroll. Mostly it s done in metal, with tubing just having a semicircular end to it. This particular photo though shows a really nice wrought iron one. It is also a true scrollin the respect that it is a diminishing spriral.